it’s such a lovely springy day here. let’s celebrate with my first bloggy giveaway! i heart sloane tanen. if you haven’t read bitter with baggage seeks same, you really must. girl is f-u-n-n-y and her chicks are hysterical. go on and check it out. i’ll wait. see how hilarious that was? now you can imagine my delight over her foray into children’s books. naturally, nugget’s library is stocked with the requisite copies of where is coco going, coco counts and c is for coco. 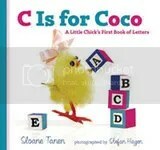 lucky for you an extra copy of c is for coco was sent our way, and now it could be on its way to you! to enter just post a comment and link back to this post on your blog. easy peasy! nugget will draw the winning name out of a hat on march 31st. Enter the bug, will you? Beautiful picture! The daffodil is one of my favorite things this time of year! The daffodil. To me a symbol of hope and of better things to come. I used them in my picture today too. I don’t have a blog, but those books are SO cute! I heart them.